A tutorial on using the Galen framework, along with the IntelliJ IDE and Java language, to perform cross-browser layout testing. Is your text aligned correctly? Is the logo aligned properly at the top left pane? Are the width and height of the textbox or any other UI object correct? Are you able to play with the color scheme? All GUI shows up appropriately in different browsers and on different devices. In this article, we will take a look on how to set up test automation environments for Galen with IntelliJ and then go ahead with writing some code. I will also show you how to generate reports for your automation test cases along with a few troubleshooting tips to help you get started on browser automation with Galen. Let’s dive in. The only pre-requisite required is the installation of JDK 8 on your machine. T get JDK 8 (minimum JDK version) if you don't already have it, visit the official website, here. After the download is complete, installation is simple. Just click and continue to finish. Once the installation is complete, you have to set up the path. Here is how you can do it! 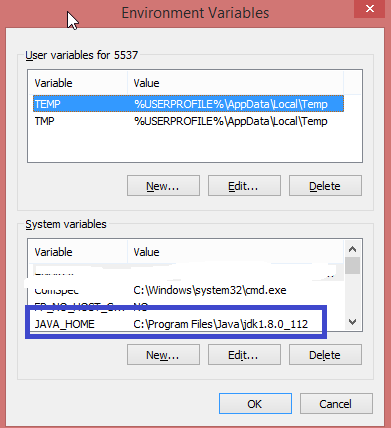 Go to windows button and look for “Environment Variables.” Once that is done, you need to select the option to “Edit System Environment Variables.” After that, click on the “New” button for adding “JAVA_HOME” as your installation path. After that, find “Path” in the variable section and double-click. In the variable value, add “%JAVA_HOME%\bin” in the path to make sure the specified version of Java is accessible on your machine. Kudos! You just installed JDK successfully on your machine. IntelliJ is a free, open-source Java IDE (Integrated Development Environment) for developing Java-based software. You can download the community version of IntelliJ from here. After downloading IntelliJ, installation is easy. Just click next and finish with a default value. 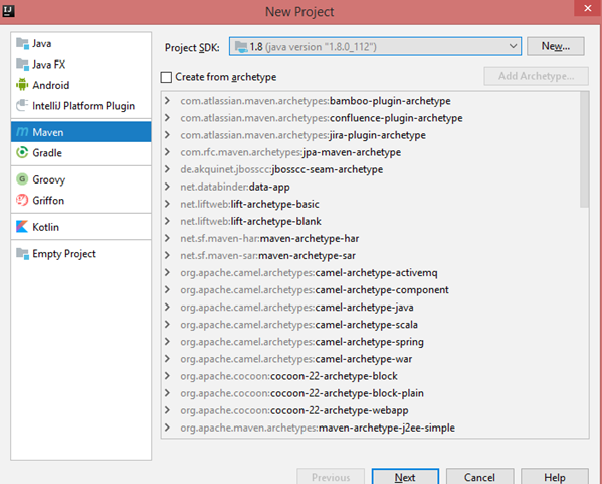 Click on Create New Project, select Maven, and click the ‘Next’ button. Enter GroupId, ArtifactId, and leave the version set to default; then click the ‘Next’ button. Leave the project name and select the location where your project is to be located. Click on the ‘Finish’ button. 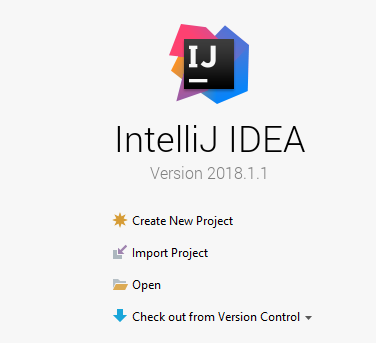 The created project displayed in IntelliJ is shown below. Please make sure to enable auto import. Go to Maven repository https://mvnrepository.com/ and search for the Galen framework. 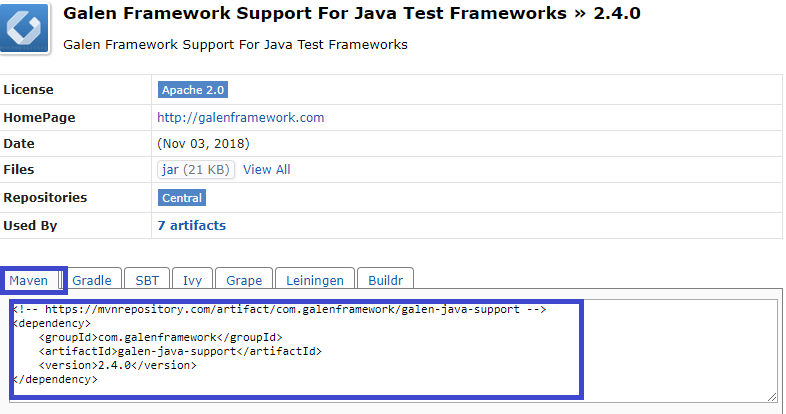 Select the latest Galen Framework support for the Java Test Framework. Select the latest version and copy the Galen framework dependency which is highlighted in the below screenshot. Copy the above Maven dependency in pom.xml in your project. Once copied, it’s dependencies and transient dependencies are downloaded from the Maven repository. For example, a dependency like Galen and transient dependencies like Selenium, along with some common libraries, will be downloaded. And, the Maven project structure looks like the below screenshot. Galen's spec language is quite flexible and gives you the opportunity to express the exact manner in which you would want your website to behave when accessed through different devices. There are two main parts in the page spec file: Object Definitions and Object Specs. This spec file is important and a prerequisite to running your automated tests. To create spec file the extension must be “.gspec”. The above spec files and its image are copied under the specs directory in the resource folder. Note: The spec file will understand if an image is present in the same directory. If not, then you would have to explicitly mention the folder name/image file. However, keep in mind that the sub-folder must reside where your spec files exist. The above spec is just for sample test execution. To familiarize yourself with this process, visit the site and play with more examples: http://galenframework.com/docs/reference-galen-spec-language-guide/. We need to write code for our automation script to work with Galen. Before you start writing code for browser automation through the Galen framework, you need a directory for your program. You can create a directory by going to the Java directory under test. Go to test->java directory-> create a directory name called “testsuites,” and create a new class. Here is an example demonstrating browser automation with the Galen framework. I will be writing code in order to verify a logo and pixel for the LAMBDATEST logo and background color, font-size for the button that says “START TESTING”. //Close and Quit the driver. Click on the hyperlink label on the left side. You will find the detailed report and failures shown on the summary page. Click on any one of the links, for example, I clicked on the visible link and it validated the below logo. Here is another example, as I clicked on CSS “background-color” the background color was verified as black. After setting up the project, in case you get any errors in IntelliJ, double check the coce by navigating to Project and right-clicking on it -> Open Module Settings -> Modules -> Select JDK version 1.8. We should maintain proper indentation in the spec file, otherwise it may throw an error. Please visit the website for more details. That was all you need to know for getting started with browser automation using the Galen framework to perform cross-browser layout testing of your website or web app. Feel free to share your opinion of this tutorial in the comment section below. I would appreciate if you have any questions for me or if you share about your experience with Galen for cross-browser layout testing? Happy testing! Published at DZone with permission of Muthuraja `Kumar . See the original article here.